Giocare con lunghezze e trasparenze è uno sfizio che mi piace assecondare quando si tratta di tessuti leggeri come chiffon, seta e jersey di cotone. Maxi accessori a creare un effetto ad accumulo tra il collier a punte e un divertente armswag con cascata di bracciali metallici di diversi colori e forme, tra cui la starfish che vedremo protagonista dei trend estivi. Playing with lengths and transparencies is the whim that I like to indulge it comes to light textures as chiffon, silk and cotton jersey. Maxi accessories to create a backlog effect between the big necklace with a fun armswag made by a cascade of metal bracelets of different colors and shapes, including the starfish that we will see as protagonist of the summer trends. Che ne pensate? Avete già cominciato ad indossare capispalla e blazer bianchi? Prestissimo vi svelerò anche qualche nuovo e interessante progetto in cui sarò coinvolta ed in cui coinvolgerò anche voi:) stay tuned!! What do you think about the look? Have you already started to wear white coats and blazers? See u soon with news and projects in which I'm involved and I'll involve u too:) stay tuned guys!! quanto sei bella??? adoro la gonna.. e poi il bracciale con le stelle marine è meraviglioso!!! Wow, ma sei bellissima. Mi piace molto questo look, complimenti. You look really amazing. Perfeust skirt and blouse. Have a nice day. questa gonna è bellissima e sta troppo bene!!! adoro il look e la gonna è...non ci sono parole! Splendida la gonna, ma anche la camicia è molto bella! Love the look! You are so beautiful! Non ho nulla da dire se non che sei STUPENDA! la gonna è semplicemente meravigliosa!! *_* wow!! 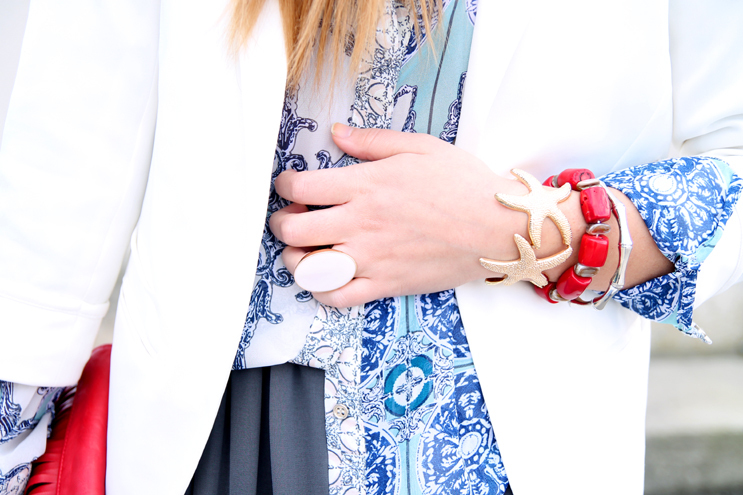 cmq concordo sul must del blazer bianco! Tutto bello, anche i bracciali ! Ottimo look! E il bracciale mi piace un sacco! Adoro queste foto e il tuo outfit! grazie ragazzi;) contenta che vi piaccia!! Mi piaci tantissimo con questo look sabri! In love with this outfit! Love how you accessorised it with the bold clutch! p.s- I am a new follower! Beh la gonna è super fantastica! You can easily restore the data file of old system to the new computer system. You do not have to make any new file and have to manually store the business data. If you face any problem to transfer the old data in new QuickBooks system, you can get the support services by calling at QuickBooks Support Phone QuickBooks Support Phone Number 1888-396-0208. You will get 24/7 support services by using this QuickBooks Support Phone QuickBooks Support Phone Number. You can also get help for other problems or information about QuickBooks. We Are More Acute For Offering You QuickBooks Point Of Sale Support For Your New System. The Nature Of Software’s And Other Equipments Are The Same Over All Intuit Chief Affiliates And You Will Be Troubles Without QuickBooks Technical Support Number. The Quickbook Technical Support Number 1888-396-0208 Tech Technical Support Uses Advance Technology and Works Efficiently. That Makes It Possible To Complete The Work In A Specific Time Period. It Resolves Many Evolving Issues And Errors. All the Points Mentioned Above Makes It Different From Other Intuit Service Provider. Pick your phone and dial our toll free number anytime, We are here to help you 24/7. QuickBooks Support is also a product of INTUIT, designed to help manage your accounting and business needs, with ease. It handles accounting, payroll and payments along features like Reporting & Finances, Inventory, Sales & Customers, Purchasing & Vendors and Payroll. Pick your phone and dial our toll free number anytime, We are here to help you 24/7.QuickBooks Support Phone Number 1888-396-0208. Quickbooks Enterprise 24x7 Tech support Number 1800-291-2485. QuickBooks Enterprise interpretation is genuinely extraordinary and most significant among three of them like that QuickBooks Pro,Premier and Enterprise. All they have all the more latest features i.e stock, impelled cost, and moved uncovering, the accounting instrument has been made beneficial, typical, versatile, thorough, and uniquely crafted to your developing needs. Another reason behind the request of the QuickBooks Enterprise is the help given to its customers promptly. Additionally as with other programming, even Enterprise form will without a doubt fall inevitably. To decide any issues related to the product the best course of action is the proficient Quickbooks Enterprise tech Support1888-557-6950 Team. QuickBooks 24 hour customer support to take care of the processes wanting to go. It's on account of reasons like these why QuickBooks is broadly assigned to as a big accounting program, one that requires business partners and business owners to realize the way to grade QuickBooks Tech support Number selection in any way moment. In the event that you are baffled as a result of mechanical hindrances of QuickBooks, keep cool you're not alone! Indeed, there are different clients who have a question utilizing their QuickBooks item or its administrations. The reason may specialized issues or client's disarray. Be that as it may, regardless of the reason is, all you have to consummate answer for the imperfections with this product. That is the reason should you dial QuickBooks Technical Support Phone Number 1888-323-1555 which will be in every case effectively accessible for unraveling the squares of QB.